Handmade Flexxball™ is no longer produced. Mattel version (known as Wobb-Ball™) is available for purchase at Toys"R"Us. If you own a handmade version, replacement rods can be purchased here. Flexxball™ is a fun and exciting ball and paddle game suitable for all ages. It takes up less than half a square foot of space, and is very portable. Easy to play and difficult to master, one can play countless times without losing interest. Flexxball™: most quiet and most kid-friendly (suitable for ages: 6+). Flexxball™ pro: compared to Flexxball™, the ball is 20% smaller and moves 20% faster. The paddles are 15% smaller. 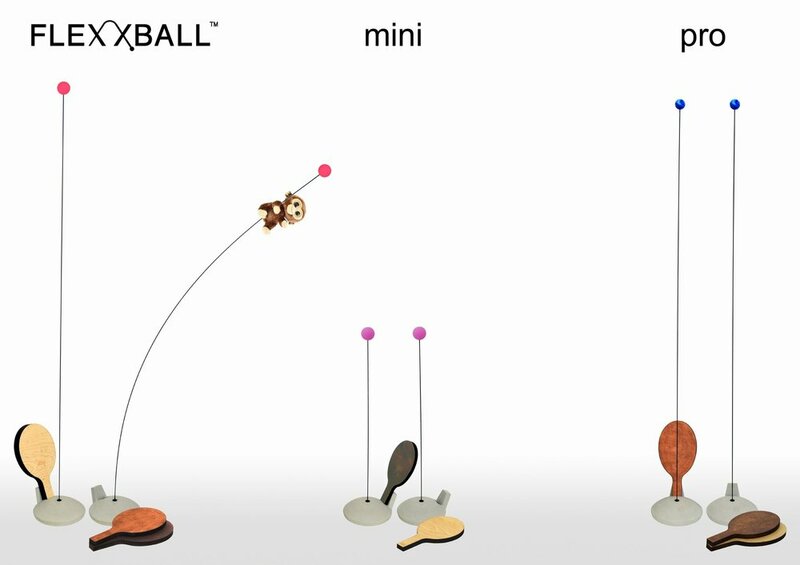 Flexxball™ mini: a single player tabletop version that is suitable for either home or office. A great way to take a break and stretch, have fun, and relieve stress as well. Flexxball™ is hand made using highest quality materials. Paddles: knot-free, glue-free Hard Maple grown in Wisconsin. Base: Made in USA concrete mix with ultimate strength of over 9000 PSI. Rods: Made in USA carbon fiber and fiberglass rods that last for over 6 months with regular use. Minor components, such as silicone and balls are foreign-made. Copyright © 2017 Flux Design Studio, LLC. All rights reserved.